The “ICT for Women” .. is the new Egyptian wind to inspire, enable and support all girls and women of Egypt. Using ICT to give them a way for realizing their dreams, overcoming problems and exploring their potential for success. 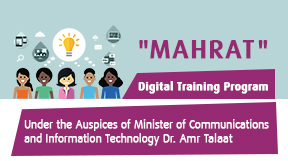 “ICT for Women” empowers women of Egypt through all aspects of life, at home, in education and at work. ICT usage among females shows an increasing trend through time, while female usage levels in comparison to those of males are almost constant; as it is clear that females still cannot acquire larger usage share from males. It is quite interesting, however that younger female generations are experiencing very high usage ICT levels. Making choices about your career? We all know career planning can be quite overwhelming. This guide by Microsoft helps university students and fresh graduates to plan their careers and nail their dream jobs.